The online leader in Native American and Southwest jewelry is offering customers incredible deals this holiday season. The online leader in Native American and Southwest jewelry is offering customers incredible deals this holiday season. SilverTribe has slashed prices across its entire stunning collection of art and jewelry, and is even offering free shipping on its entire inventory. 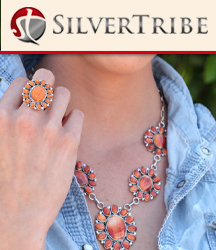 SilverTribe prides itself on having the largest collection of southwest turquoise jewelry on the web. Anyone who has been in search of great holiday gift ideas should search no more. SilverTribe is also encouraging customers to sign up for its Preferred Member program. By doing so, customers will be kept up to date on the latest specials throughout the holiday season and beyond. By joining the Preferred Member program, amazing holiday gift ideas will be delivered straight to a customer's inbox. SilverTribe will ensure that no one is left out this holiday season. To see the latest in beautiful southwest turquoise jewelry or to find other great holiday gift ideas, visit the official site at silvertribe.com.